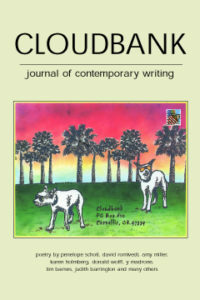 Cloudbank 2 includes poetry and flash fiction by Penelope Schott, David Romtvedt, Amy Miller, Karen Holmberg, Donald Wolff, y madrone, Tim Barnes and others. Starting from Anywhere by Lex Runciman and Light from a Bullet Hole: Poems New and Seleted 1950-2008 by Ralph Salisbury are reviewed. The same might be said for poetry: Most of us are drawn to work that is carefully crafted and revised, rather than something raw and unfinished. Fortunately, many of us can appreciate both indoor and outdoor art, the grandeur of Notre Dame Cathedral, as well as Yosemite Valley. Spontaneity and order both have their merits, as do fruits plucked from the vine and gratins de fruits rouges. We hope you’ll enjoy both modes of writing in this issue. Even the ugly boy can dance. the radio turned up loud.